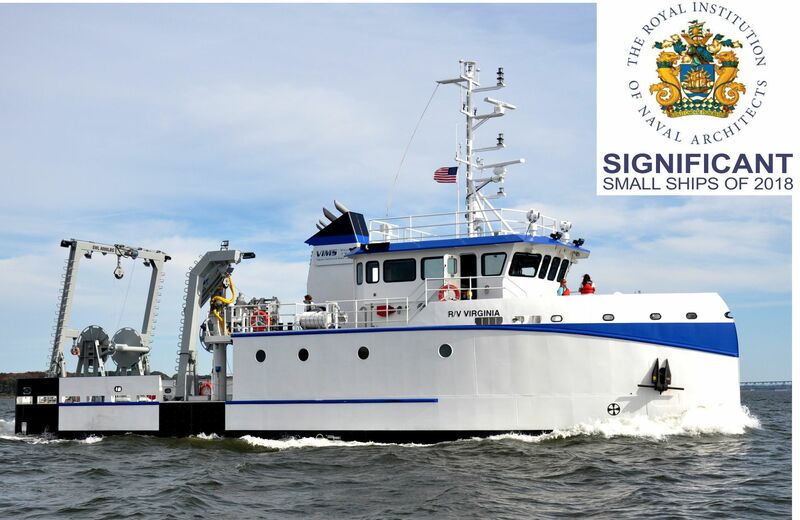 JMS Naval Architects is proud to announce that the Royal Institution of Naval Architects has selected the R/V VIRGINIA as one of the Significant Small Ships of 2018. Each year, the world renowned professional institution narrows its selection down to 30 of the most unique small vessel designs from around the world which reflect a high-degree of design innovation across the marine sector. Founded in 1860 in London to “advance the art and science of ship design,” the Royal Institution of Naval Architects is highly respected international professional institution and learned society whose members are involved at all levels in the design, construction, maintenance, and operation of all marine vessels and structures. Their members are widely represented in industry, universities and colleges, and maritime organizations in over ninety countries. The 93-foot research vessel VIRGINIA was designed by JMS for the Virginia Institute of Marine Science. The design contract was competitively awarded to JMS and included concept through contract-level design, shipyard bid support, and on-site Owner’s Representative/Construction Oversight services including tests and sea trials. 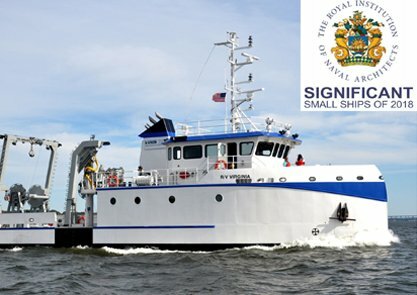 With prestigious recognition received from the Royal Institution of Naval Architects, R/V VIRGINIA joins the ranks of JMS’ other award-winning research vessel designs, such as the ARCTICUS designed for the U.S. Geological Survey (Workboat Magazine’s Significant Boats of 2015 Award) and the R/V FAY SLOVER designed for Old Dominion University (Professional Mariner Magazine’s American Ship Review – Significant Boats of the Year Award).